The volcanic La Garrotxa region of Catalonia lies between the Pyrenees & the beautiful Costa Brava region in Spain. La Garrotxa is best known for its well-preserved medieval villages, good food, outdoor activity opportunities, Romanesque churches, and volcanic park. La Garrotxa Volcanic Zone Natural Park is one of the best preserved volcanic landscapes in Europe, containing 40 inactive volcanoes. If you are looking for a rural escape from Barcelona or Costa Brava, La Garrotxa is a short distance away making for a perfect Girona or Barcelona day trip or weekend getaway spot. Scenic vistas, rural landscapes, and medieval villages abound here. With a large network of trails, Garrotxa is a popular destination for both hikers and cyclists. 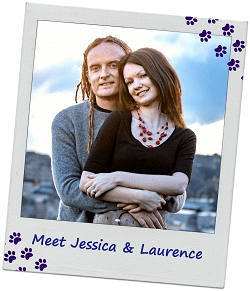 Laurence and I have been lucky enough to have visited La Garrotxa several times and we seem to be in the area at least once a year. 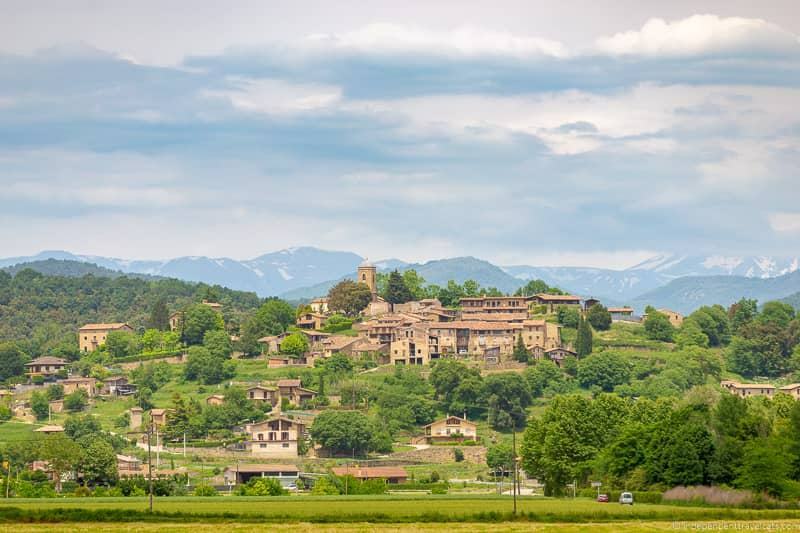 In this post we’ll share all you need to know to plan a trip and travel within this beautiful region of the Girona Pyrenees. We’ll tell you how to get here and share ideas on where to stay and what to do in La Garrotxa based on our own travels here. How to Get to La Garrotxa? How to Get around Garrotxa? Guided Tours to La Garrotxa? Best time of Year to visit La Garrotxa? Where to stay in La Garrotxa? Where to Find More Travel Information about La Garrotxa? Before we start listing all the things to do in La Garrotxa, we wanted to share some handy travel planning information. 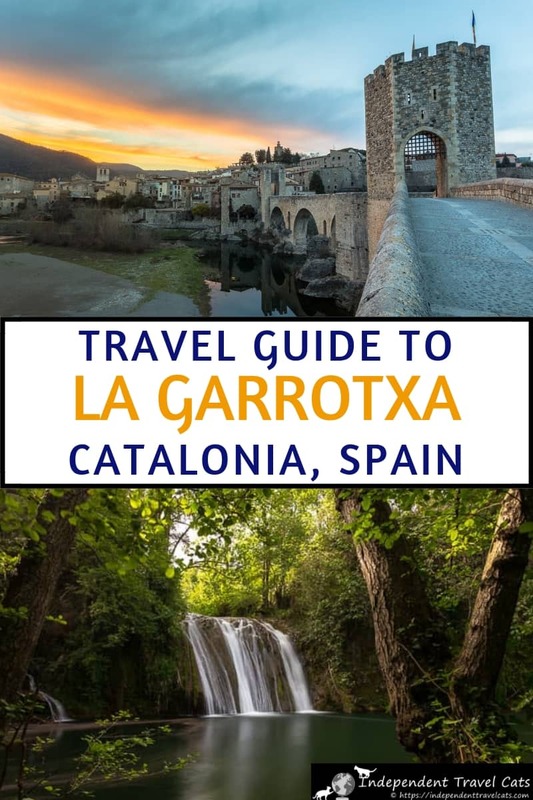 This includes advice and tips about getting to La Garrotxa, getting around La Garrotxa, where to stay in the region, the best time of year to visit Garrotxa, and where to find further information. La Garrotxa is a region within Catalonia that is located within the province of Girona in Spain. It is about 735.4 km² in size. The landlocked region is part of the Girona Pyrenees region. The center of the region is located about 44km (30 miles) northwest of Girona and 120 km (80 miles) northeast of Barcelona. The northern part of La Garrotxa borders France. There are number of different ways you can travel to La Garrotxa, these include by plane, car, bus, train, and guided tour. The two major airports near La Garrotxa are the Barcelona Airport (largest airport) and Girona Airport. If arriving by air, you’ll then need to travel to La Garrotxa by car, bus, taxi, or guided tour. Traveling by car can be a good option if you are traveling from elsewhere in Western Europe. From Barcelona, it is an approximate 1 hour and 50 minute drive to Besalú and a 1 hour 45 minute drive to Olot. From Girona, it is an approximate 35 minute drive to Besalú and 50 minute drive to Olot. The local bus service is fairly good to most of the cities and larger towns of the region; however, it may not get you to some of the small villages, trailheads, or natural attractions you may want to visit so you may need to use local taxi services as well. Use the helpful Teisa Bus website to check on routes, times, and fares. If traveling by train, the closest train stations are in Vic and Girona but there is no train service to or within La Garrotxa. You can check local train services here. If you arrive by train, you can then get to La Garrotxa by car, bus, taxi, or guided tour. If you don’t have a car and don’t want to use public transit, there are a number of regular guided day tour that depart from both Barcelona and Girona. See the Guided Tours section below for options. The easiest ways to get around is by car. But you can also get around by joining a guided tour or taking a taxi. Cycling and hiking are also popular, if slower, ways to get around La Garrotxa! The best places to rent a car in the area are Barcelona and Girona. You can check and compare rental car prices across companies at Priceline if interested in renting a car for the trip. We often find that Enterprise has the best car hire rates. If you don’t have a car but still want to visit the region, it is still possible by taking a guided day tour. There are a number of day tour options from both Barcelona and Girona. This is a good option if you are just wanting to see some highlights of La Garrotxa. There are also self-guided and guided multi-day cycling tours that go through this region as well if you are interested in a cycling holiday. This small group tour from Barcelona includes a drive through the Volcanic Park and stops in the villages of Castellfollit de la Roca, Besalú, and Santa Pau. 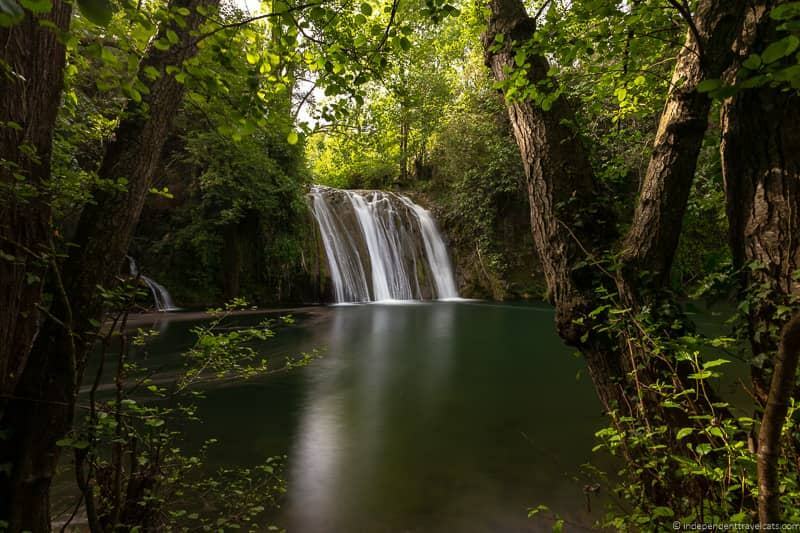 This full-day tour is focused on hiking within the La Garrotxa Volcanic Zone Natural Park (Santa Margarida Volcano and beech forest), and includes a 3-course restaurant lunch as well as stops at waterfalls and visits to the towns of Castellfollit de la Roca and Besalú. This private tour from Barcelona includes visits to the villages of Santa Pau, Vic, Castellfollit de la Roca, and Besalú. 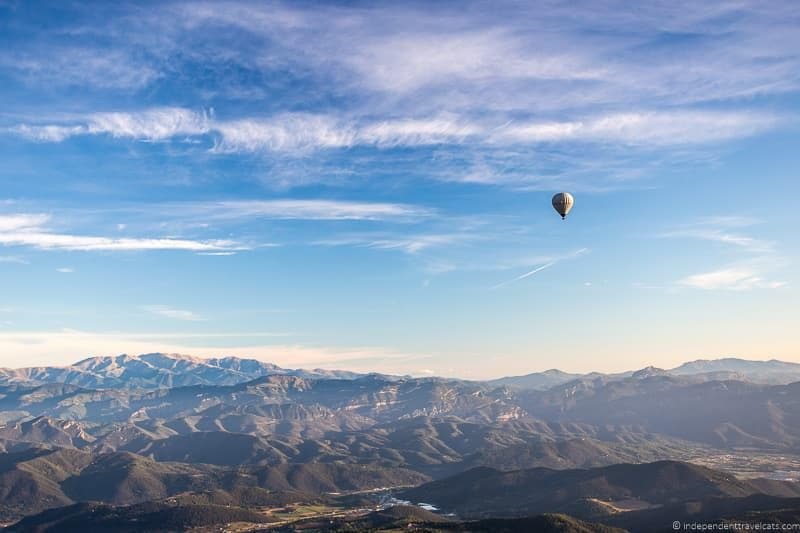 This private tour includes a private hot air balloon ride over the Volcanic Park, brunch, and a guided visit to Besalú. 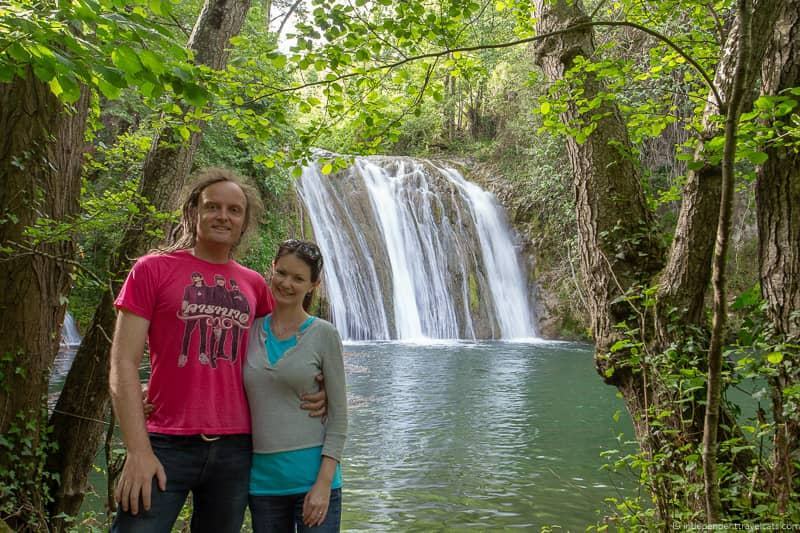 This tour from Girona includes hiking within the La Garrotxa Volcanic Park, a packed lunch, a waterfall, and visits to the towns of Santa Pau and Banyoles. 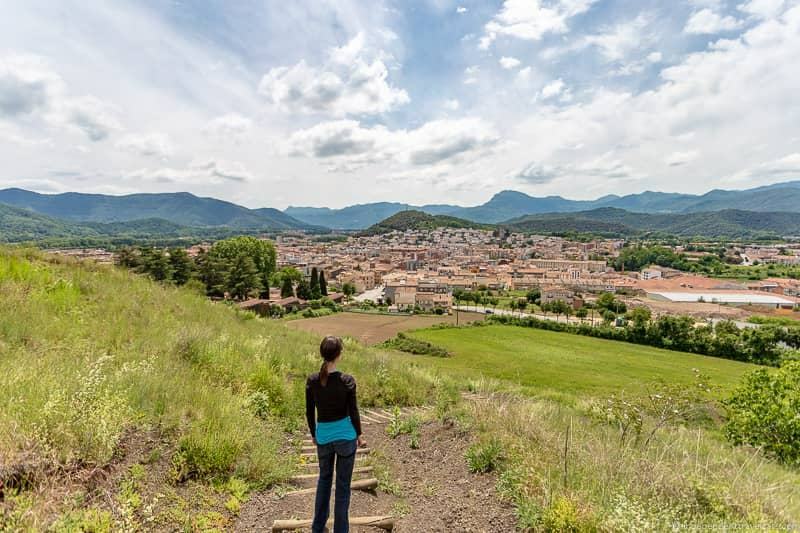 This half day hiking tour from Girona includes a hike (5 to 8 miles depending on the time of year) in the Alta Garrotxa area with a professional guide, where you see beautiful scenery, hermitages, Romanesque churches, gorges, and medieval bridges. A popular way to explore this region is by bike so many of the multi-day trips offered in the area are cycling tours. Most include time in Garrotxa, other parts of the Pyrenees, and Costa Brava. Some are self-guided (they give you a route, luggage transfers, and book lodging) and some are fully guided. For example, there is this self-guided 7-day cycling trip (begins and ends in Figueres) and you can see a number of other available multi-day cycling tours here. It really depends of course on what you want to do in the area, but we personally think that the Fall (autumn) and Spring are the most pleasant. During these seasons, the weather is often pleasant and it is less crowded, and most attractions are open in the area. Both are nice seasons for hiking and cycling. Autumn is probably the favorite time of year for cycling in this area. Summer is also a nice time of year as there are more daylight hours, more festivals, and a more lively atmosphere due to there being more people. This is a popular time for day trippers to visit, but this also means prices can be higher in certain areas and some of the more popular towns can be crowded. Winter is the best time if you want to see snow and if you want to enjoy some of the winter activities of the area like skiing, snowboarding, snowshoeing, tubing, etc. These activities are not offered in La Garrotxa, but are a short distance away in the Spanish Pyrenees regions of Catalonia in both El Ripollès and La Cerdanya. Note that if traveling in winter, winter weather can make hiking and driving more difficult, particularly in the northern part of the region of Alta Garrotxa. We’d recommend having winter tires and/or snow chains if driving in the Pyrenees in winter. Note that rain is common throughout the year, so it is best to come prepared with appropriate rain protection clothing and gear. Winter is the driest season. There are a lot of places to stay in La Garrotxa, which include hotels, bed-and-breakfasts, apartments, vacation homes, and hostels. It is an hour’s drive or less to reach any place within this region so we’d definitely recommend choosing just one place to base to explore this region. You can see and compare the lodging options in this region here. In terms of budget, it is easy to find something to suit just about any budget and the region (in fact the entire Pyrenees area) is full of good-value stays. Most hotels and B&B’s, especially those located outside of a town or city, offer breakfast and dinner. 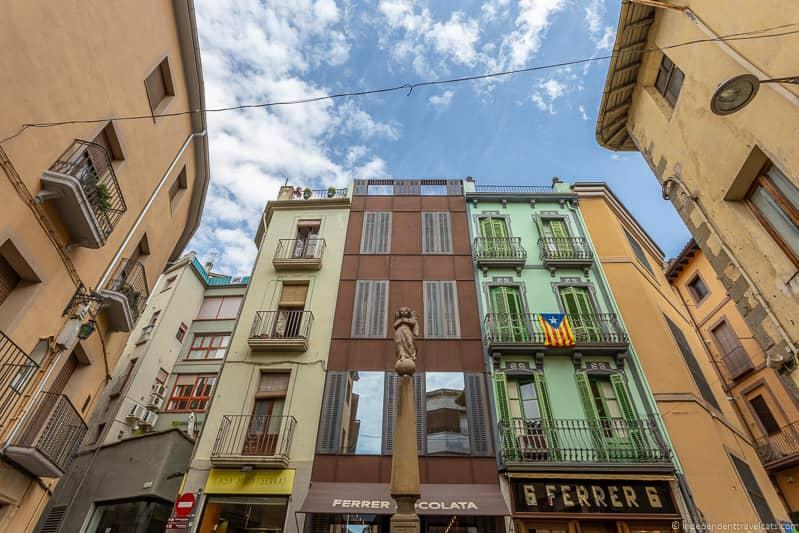 If you are looking for a city with more services, I’d look for lodging in or near Olot as it is the capital of the region and has by far the most shops, restaurants, and tourist services. If you are looking for a quieter spot, I’d look for lodging away from Olot and Besalú. La Rectoria de Sant Miquel – Sant Felíu de Pallarols – This cozy B&B is set in a 12th century rectory offering several guest rooms and 2 lounges. Located just off the Olot-Girona Greenways cycling trail. Free breakfast included, and dinner is also offered to guests. Run by a lovely Catalan-Scottish couple and a great place to stay, we’ve stayed twice! Hotel Vall de Bas – Joanetes – This large rural hotel offers an outdoor swimming pool, breakfast buffet, restaurant, gardens, and terrace. A modern hotel built from a restored farmhouse located in the Bas Valley. We had dinner here twice during our stay and they offered a changing menu featuring a number of Spanish and European dishes. Hotel Cal Sastre – Santa Pau – This boutique hotel is made up of two 15th century properties and offers a traditionally decorated rooms with period features within the heart of medieval Santa Pau. The hotel also has a restaurant. We haven’t stayed here but had a wonderful dinner here on the terrace, one of our favorite meals in the region! Les Cols Pavellons – Olot – If you are looking for something unusual and more upscale, the Les Cols Pavellons features rooms made of glass floors and walls. Each of the pavillions has a heated onsen bath, a private bathroom, and a comfortable futon mat. Next door is the Michelin-starred Les Cols restaurant or you can enjoy a private picnic by sun and candlelight in your room. Book well in advance as rooms are often sold out a month in advance. La Torre Malagrida – Olot – This well-rated hostel offers double, quadruple, and larger dormitory style rooms with shared bathroom and dining areas at very budget-friendly rates. The hostel is located in a beautiful old house. Els Jardins de la Martana – Besalú – This well-rated 3-star hotel located right next to the medieval bridge of Besalú and the tourist information office. Includes a lounge, library, and gardens. Very homey feel and we’d stay again, but note that it can be a bit noisy outside the hotel as it is in such a popular location. Mas Pineda – Oix – A beautifully restored 13th century farmhouse B&B in a peaceful location with lovely grounds and a farm with farm animals. Breakfast is included and dinner is an option. Masia el Puig – La Vall de Bianya – Located within the Garrotxa Nature Reserve, this adult-only hotel is designed for those looking for a tranquil getaway and a bit of pampering. The resort offers a restaurant, bar, outdoor swimming pool, Russian sauna, solarium, and a library. Good spot for a romantic couples weekend. Hostal Mont-Rock – Montagut – A budget-friendly guesthouse located between Montagut and Castellfollit de Roca. Offers lunch and dinner options. A short walk to Castellfollit de Roca. For more information check out the official Garrotxa tourism website, and you can also find individual tourism websites for many of the towns in the region. Once in the region, you can find tourism offices in Olot, Besalú, Sant Joan les Fonts, Santa Pau, Sant Feliu de Pallerols, and Vall d’en Bas. Although many people in the tourism industry speak English, it is less common in the smaller villages and for those outside the tourism industry. Most people in La Garrotxa speak both Catalan and Spanish (many also speak French), so learning a few essential phrases and having a translation app is helpful. We often used a translation app for menus which in smaller villages may come only in Catalan. 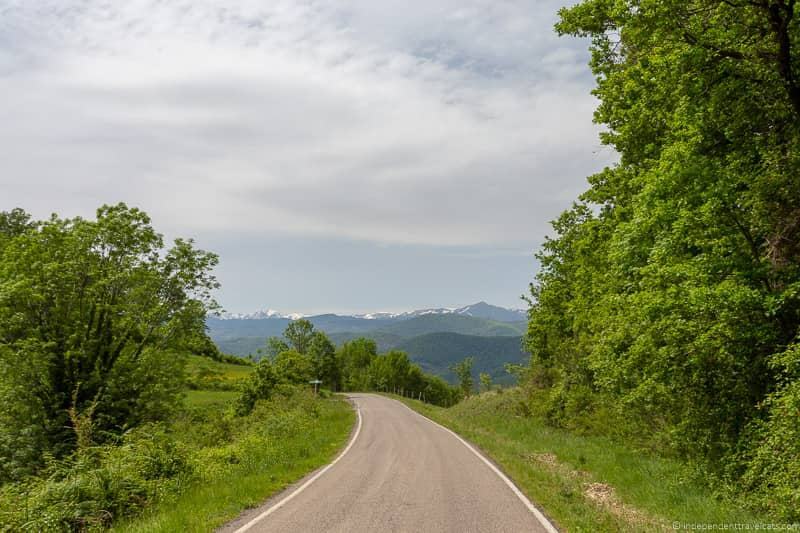 For other information about the Spanish Pyrenees area, we have a post that covers the entirety of the Girona Pyrenees area as well as guides to the neighboring Pyrenees regions of El Ripollès and Baixa Cerdanya. If you are also planning to explore Girona and the Costa Brava area check out the very helpful Costa Brava Girona tourism website to get started. We also have articles on visiting the fishing village of Palamós, hot air ballooning in Costa Brava, adventure activities in the area, and a guide to the Salvador Dalí attractions in Costa Brava. For those who plan to spend some time in Barcelona, check out our suggested 3-day Barcelona itinerary, our Barcelona Pass review, and our guide to the Gaudí sites of Barcelona to get started. For those exploring other parts of Catalonia, check out the information-packed official Cataluyna tourism website. If you are traveling into other areas of Spain, the Spanish tourism website is a great resource. We don’t know of any good English general travel guides to the Girona Pyrenees or Spanish Pyrenees but you might try a general Spain or Catalonia guidebook. If you are looking for a map for driving or planning your time in the Pyrenees, you might try this one or this one. For hiking resources, we can recommend this guide and the local Itinerànnia hiking maps (if you can’t find it online, you can buy them once in the region). If you have any questions as you plan your visit, feel free to leave us a comment in the Comments section at the end of the post and we’re happy to try to help or give you our suggestions. There are so many things to do in Garrotxa, and you can easily find plenty to do to fill a weekend or a 2 week trip. 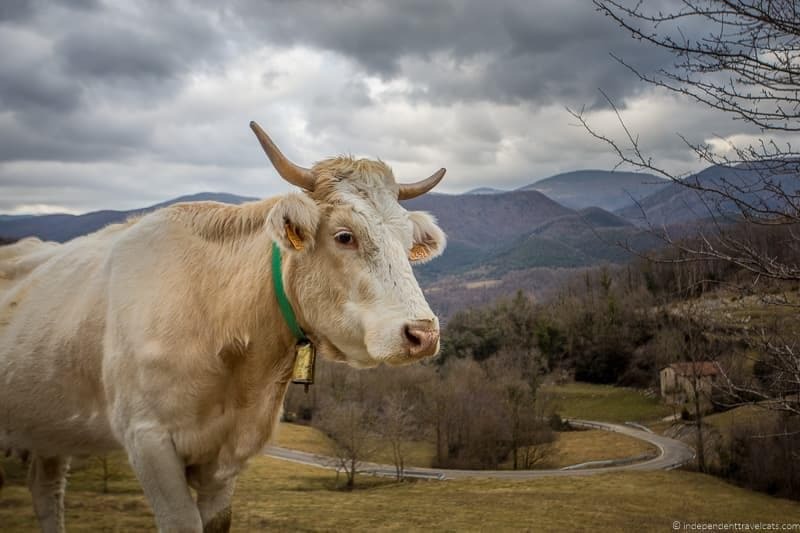 But here are 15 of our favorite things to do in La Garrotxa that should give you plenty of ideas to start planning your trip. 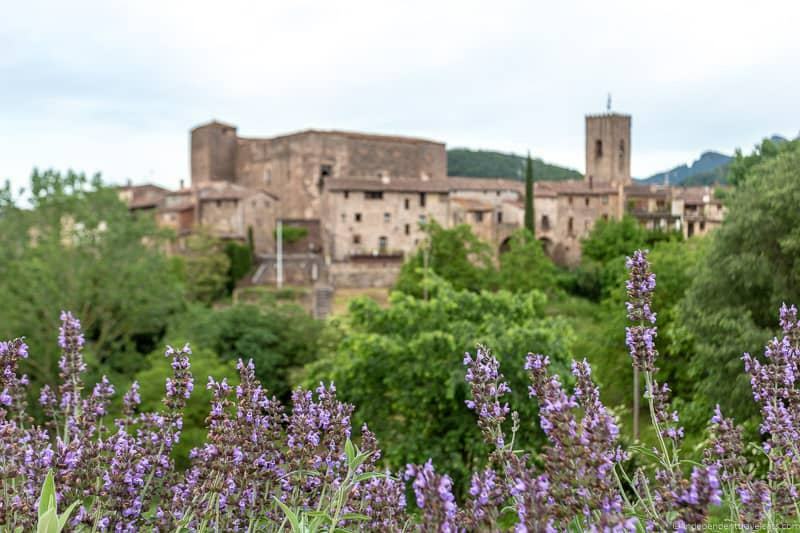 There are lovely medieval villages through La Garrotxa, The area’s best preserved medieval villages are Santa Pau, Besalú, Sant Joan les Fonts, and Sant Feliu de Pallerols. You can find medieval bridges, squares, churches, old mills, and ruined castles in the old quarters of these towns, and each is worth taking the time to explore. Besalú is the best preserved medieval village in La Garrotxa, and one of the best preserved medieval towns in Catalonia. 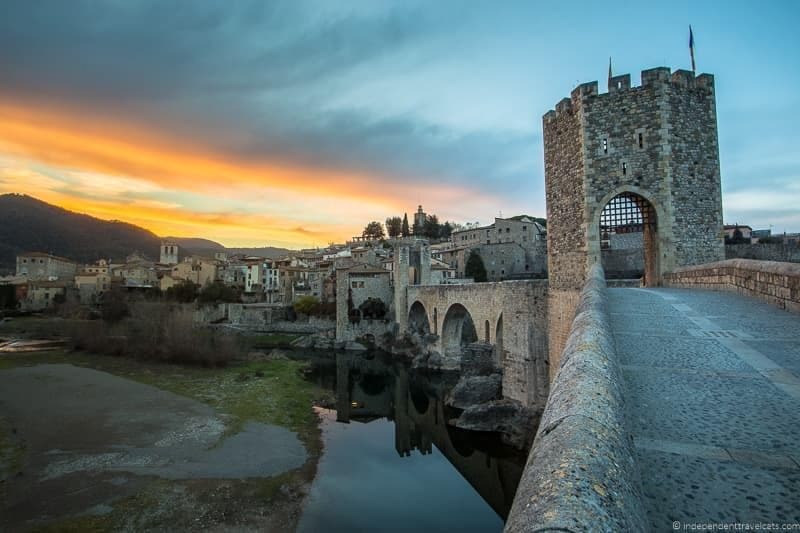 Besalú has been inhabited since at least the Iron Age, evidence of a market exists from at least the 11th century, and by the 14th century it was the commercial center of La Garrotxa. Besalú has a number of historical buildings and structures including a medieval stone bridge, the Monastery of Sant Pere, Casa Cornellà, Sant Julià church and hospital, and remains of a synagogue. Each September, Besalú holds a popular Medieval Festival that celebrates its past and everything medieval. Besalú is the busiest town we’ve been to in La Garrotxa and in summer it can feel a bit too crowded, so do expect crowds and tour buses here. 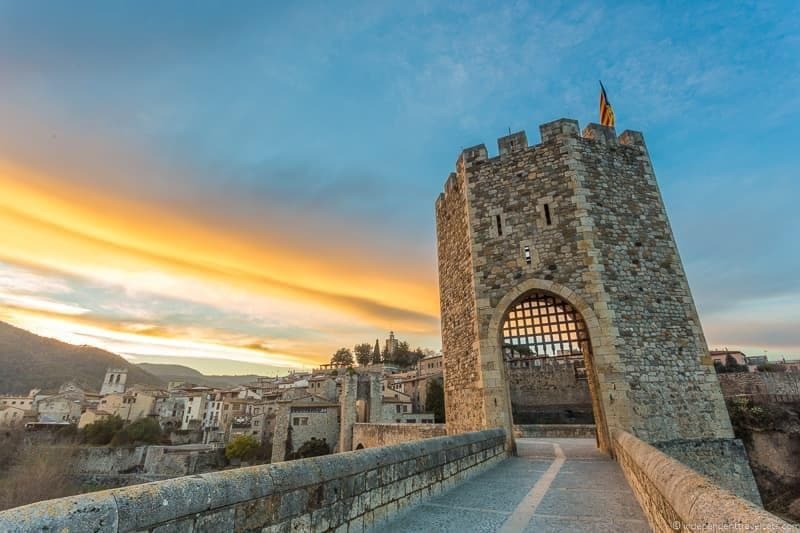 The visitor center is a good source of information, and if you plan to visit, you can read this guide to things to do in Besalú. We also really enjoyed exploring the medieval centers of Santa Pau, Sant Joan les Fonts, and Sant Feliu de Pallerols. Santa Pau is a favorite of ours but we’ve visited all these town multiple times now and each is different and worth a wander. We recommend picking up a tourist walking map for each to help you explore and there are information panels at many of the town highlights. Most of the towns and villages in Garrotxa have remaining medieval centers or buildings, so you’ll likely find reminders of a medieval past in almost any of them. 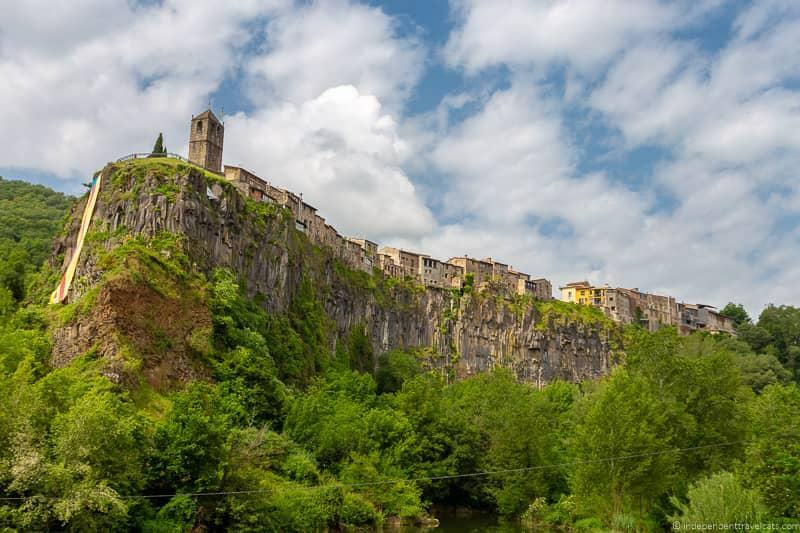 A couple of other villages we’ve enjoyed exploring were tiny El Mallol and the perched village of Castellfollit de Roca. 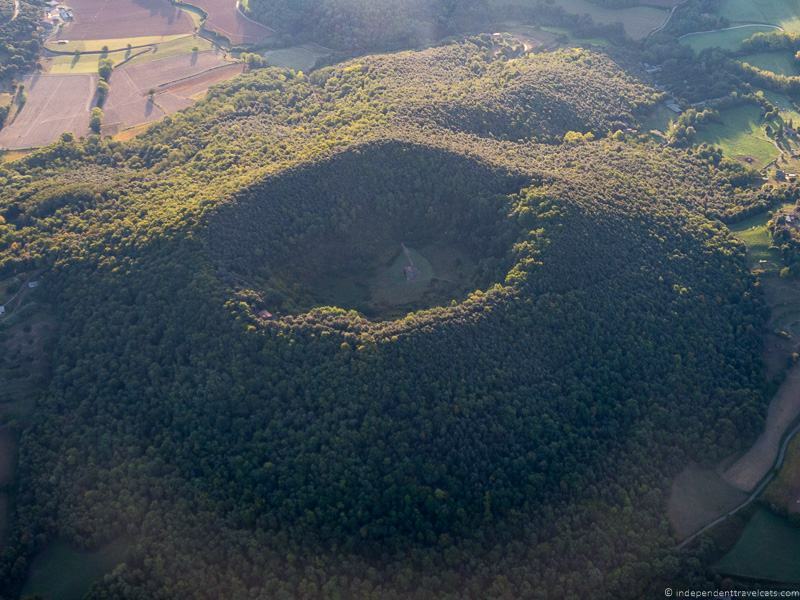 La Garrotxa Volcanic Zone Natural Park is considered to be one of the best examples of a volcanic landscape in Europe, containing over 20 lava flows and 40 inactive volcanoes. The park is huge and within the park are 26 different natural reserves. A good place to start is to head to make a stop at one of the park’s information centers to gather information and learn more about the park. Whether you are interested in volcanos and geology or not, you’ll likely find plenty to do with this large natural park. Here is a list of highlighted towns and attractions within the park that can help get you started. There are a number of hiking, long distance footpaths, and cycle paths that run through parts of this park if you want to actively explore the park. You can get a bird’s eye view of the volcanoes by taking a hot air balloon flight, hop on a Segway or electric bike to explore with Naturatours, examine the basalt lava flows at Sant Joan les Fonts, or hike into the center of a volcano. Learn more about volcanoes at the Volcano Museum, located within the El Parc Nou gardens in Olot. Two easy volcano hikes are to Montsacopa (short but steep hike from Olot city center) and Santa Margarida (volcano cone with a hermitage in the center). Some other recommended hikes we’ve done in this area are within the La Fageda d’en Jorda (beech forest) and Volcà del Croscat Natural Reserve (can see a cross-section of a volcanic cone here). 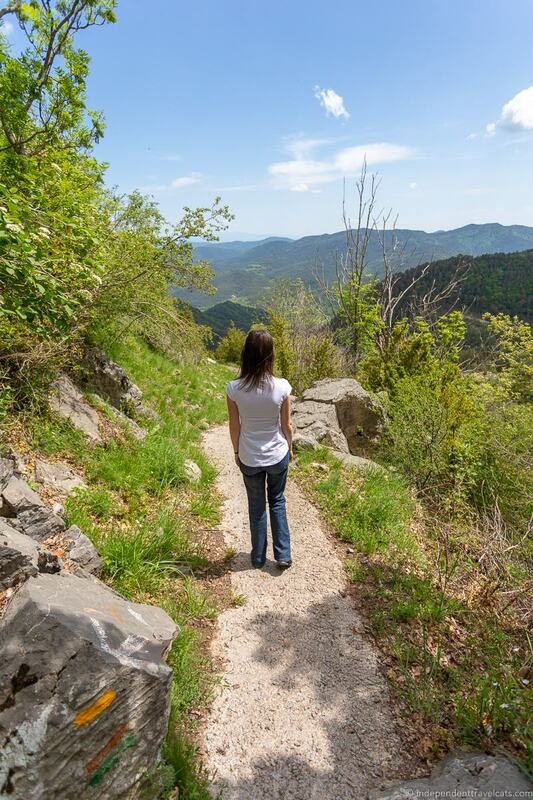 There are a number of walking trails throughout the La Garrotxa region and it is a popular region to hike. There are international, national, regional, and local trails which gives you a lot of hiking opportunities. They vary from challenging long-distance trails to easy and accessible short trails. 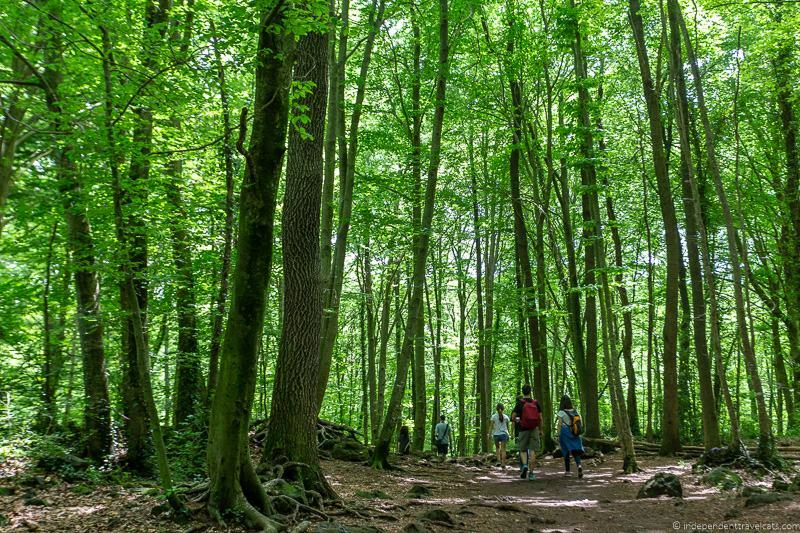 One of our favorite places to hike in La Garrotxa is within La Garrotxa Volcanic Natural Park as it offers beech forests, nature reserves, and extinct volcanoes. 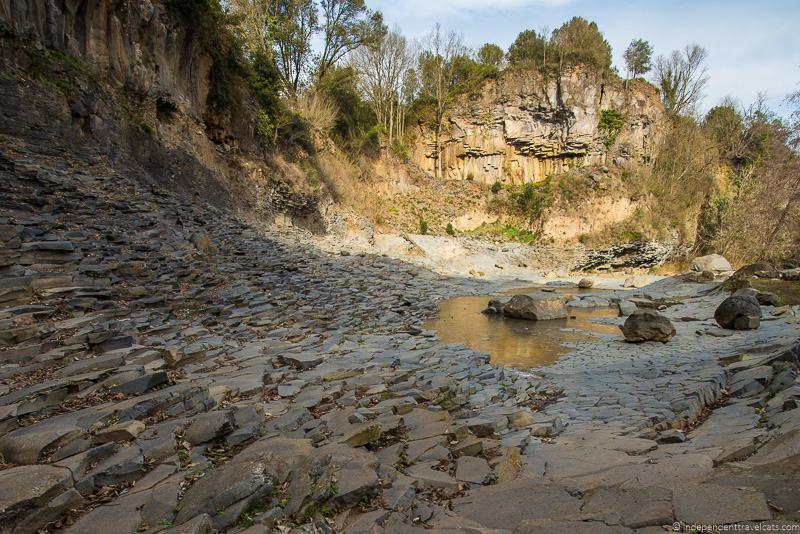 La Garrotxa Volcanic Natural Park is a great natural setting offering a larger variety of trail options and here is a list of walking itineraries within the park. Another of our favorite areas is the Alta Garrotxa Area of Natural Interest and Sant Aniol d’Aguja valley in the northern part of the region. It offers a number of hiking paths, many beginning in Montagut or Saderness. Common things to see along the trails here include gorges, caves, hermitages and churches, and stone bridges. Guided hikes in this area are also possible such as this hike. The Alta Garrotxa area is also a popular place for climbers. If you are planning to do some longer or multi-day hiking trips, the Vías Verdes (literally, “green-ways”) are a series of old railway lines throughout Spain that have been turned into trails for hikers and cyclists. A popular path is the 23.5 km (14.6 miles) section of the Greenways Olot-Girona path that runs from Olot to Les Planes d’Hostoles within La Garrotxa. Many sections of the Greenways are accessible to those with reduced mobility and in wheelchairs. Some of the Gran Recorrido network paths (GR; Gran Recorregut in Catalan) run through La Garrotxa. These include GR 1 (Sender Histórico), GR 2 (La Jonquera-Aiguafreda), and GR 11 (Spanish Pyrenees). Although we’ve found most trails to be well-marked in the Pyrenees, we have found that given the number of crisscrossing trails, it can be at times confusing as you may see a rock with 4 or 5 different trail marks. So it is important to know the trail you are following, its markings and signposting (e.g., GR trails have red-and-white symbols and the regional Itinerànnia have yellow markings and signs), and to have a map and proper hiking gear if you are going on longer hikes. We’ve also found some trails, especially those that are more rarely traversed are less well-signed (or signs have been damaged) making them harder to follow. We have found the following to be helpful hiking websites for La Garrotxa: the Itinerànnia website, Garrotxa tourism hiking suggestions, and the Traildino website. There is also an Itinerànnia mobile app you can download. The local tourist visitor centers are also good resources for information on local walks and trails. For Pyrenees hiking resources, we can recommend this hiking guide, the Cicerone guides to any specific long-distance trails (e.g., GR trails) you plan to do, and the local Itinerànnia hiking maps (if you can’t find it online, you can buy them once in the region). The main cycling route in La Garrotxa is the Vías Verde (Greenways) Carrilet Olot-Girona Narrow Railway Route. 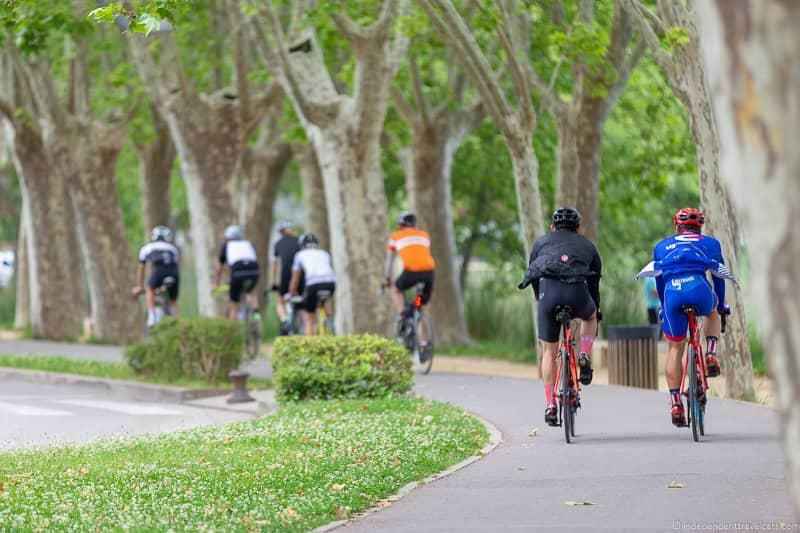 It is a 54km (33.5 mile) cycling and hiking route that follows the route of a disused railway line that once connected Girona and Olot. A popular 23.5 km (14.6 miles) section of this route lies entirely within La Garrotxa between Olot and Les Planes d’Hostoles. You can also keep going from Girona via the Girona-Sant Feliu de Guíxols Greenway all the way to the Mediterranean coast! Laurence cycled sections of these two Greenways routes as part of a 3-day trip starting in the Pyrenees and ending up in Costa Brava. You can read about his cycling trip experience to get a sense of some of the things you might see along the way. There are also several shorter cycle routes in La Garrotxa, the majority of which connect up to the Vías Verde Olot-Girona Narrow Railway Route. There is also a 5 km circular route around Besalú. Many of these cycling routes are suitable for those of all cycling levels. You can check out the main local biking routes here. If you plan to cycle other areas within the province of Girona, I’d check out this info for more about cycling throughout Girona. Although you can head out biking all year round in La Garrotxa, the best times are probably Autumn and Spring. Summer is popular but can be hot, and winter means cold weather and the possibility of snow and ice on the trails. So we’d recommend Fall or Spring if you are thinking of planning a cycling trip in this area. If you are not traveling with your own bike you can easily rent one (including electronic bikes and mountain bikes) in Olot, and many hotels can also arrange bike and helmet rentals. You can also rent a bike in the bigger nearby cities of Barcelona or Girona. Girona is a popular place to rent a bike and return if you plan to follow the Olot-Girona Greenways cycling route to La Garrotxa. The bike rental companies are also a great place to learn about local trails, get maps, and pick up any biking gear you need. If you are looking to do a self-guided (with luggage transfers) or guided cycling tour, you can check out this list for some options that include La Garrotxa. Hot air ballooning is a fun and popular activity in La Garrotxa. Most of the hot air balloon flights last from 1 to 2 hours and fly over the Garrotxa Volcanic Zone Natural Park. This is a great way to get a bird’s-eye view of the volcanoes and volcanic landscape. Most flights also include breakfast or lunch. We did this balloon flight with Vol de Coloms that begins just outside of Santa Pau and had a fabulous morning. 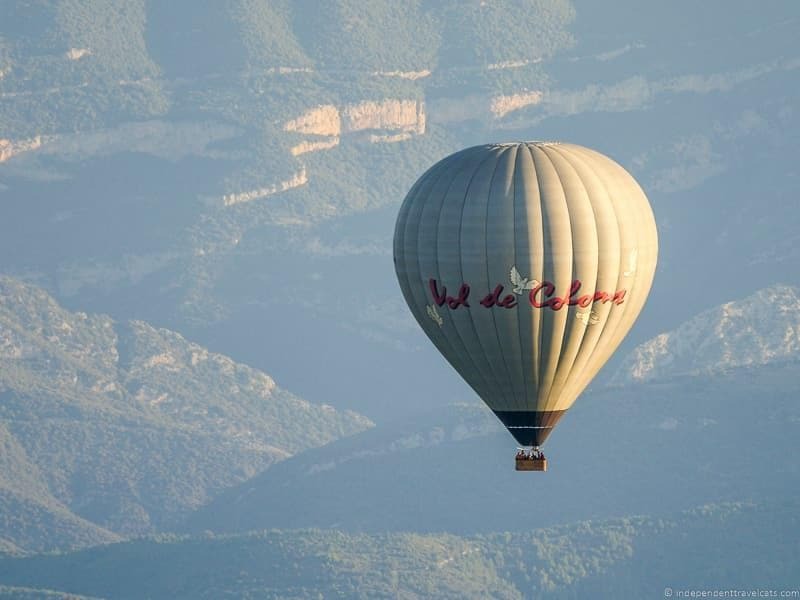 It started with coffee and watching the balloons inflate, then the ride itself which included great views as well as champagne and snacks, and then after the flights we were treated to a huge buffet brunch of Catalan specialities! Both group and private hot air balloon flights are available, and transport from Barcelona can also be arranged. You can read about our experience and more info about ballooning in Garrotxa here. 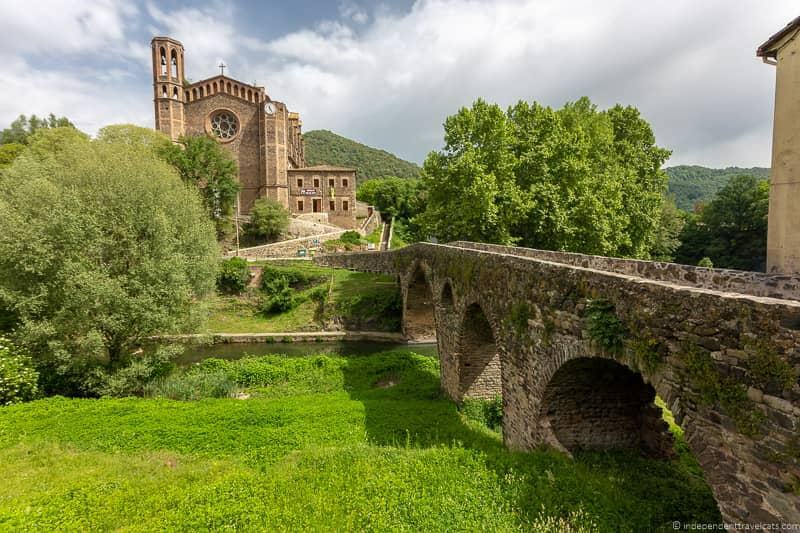 Catalonia is filled with old churches, and in La Garrotxa you’ll find a large number of Romanesque churches (10th to 13th century) as well as a few Gothic churches (12th to 16th century). So if you love seeking out picturesque stone churches, many sitting in peaceful settings, you’ll have plenty to discover here. If you are unfamiliar with Romanesque architecture, a few things almost all the churches in the area have in common is that they are oriented to the east, have an apse, have thick walls, a curved ceiling, a Latin-cross layout, were decorated with frescoes (sometimes on the exterior as well), and have small windows or openings that generally allow in very little light. Many of the medieval churches in La Garrotxa were damaged or destroyed in the 15th century from a series of large earthquakes but a number of them survived or were rebuilt. If you are interested in doing a driving route to see some of the churches, we recommend heading to the La Vall de Bianya area of La Garrotxa. 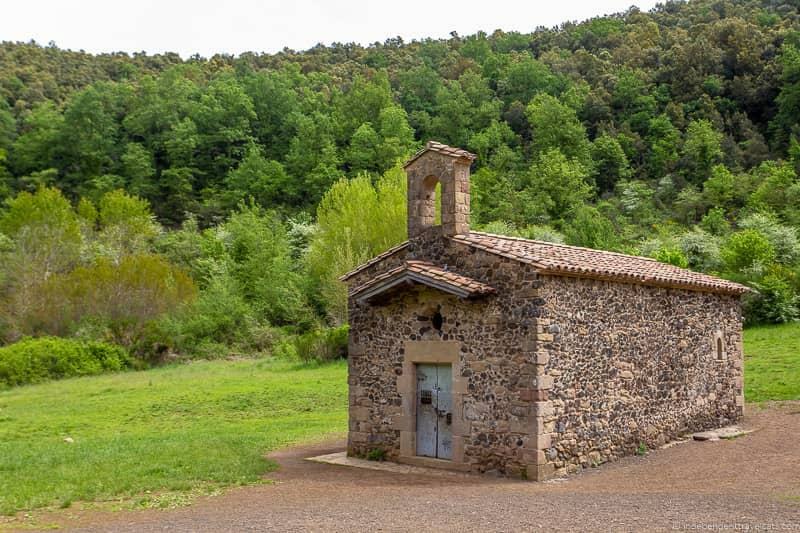 Here you can follow a route to visit 15 Romanesque churches and hermitages and each has an interpretation panel (in Catalan, Spanish, English, and French). You can follow the route by car or bike but some of the final approaches need to be done on foot to reach the churches. The route is designed to take about 3 days if you want to visit them all, but you can just choose to do a section of the drive. 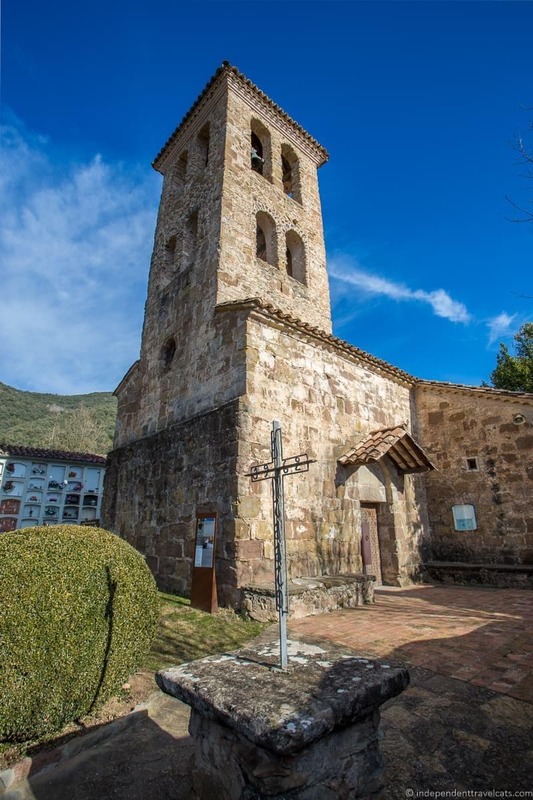 If you plan to drive the Romanesque Church route, you may want to start with a visit to the Vall de Bianya Landscape Interpretation Center in Sant Salvador de Bianya. I’d recommend calling or emailing the center in advance of your visit as their hours are sometimes sporadic. They can provide local information on the churches (and other attractions) and arrange guided visits of the 12th century Church of Sant Salvador de Bianya which is next to the visitor center. Most of the Romanesque churches are still active and consecrated, but many are only used for special occasions and holidays. This means that most of these churches are infrequently open and most are kept locked. They are also often on private property, so do be respectful when visiting. If you would like to see the interior of a church that is locked, you can ask at the local tourism office or see if there if there is a local phone number listed on the outside of the church of a person who has the keys. If you want to learn more about Romanesque churches, I’d consider getting a copy of this guide which gives details of the Romanesque churches in Spain (a large number in Catalonia). The guide helps give more background on each church as there is little English language information at most of the churches. Olot is the capital city of the comarca of Garrotxa, and is the largest city in the region. There are no large cities in La Garrotxa and Olot at about 35,000 people, is as big as they come! More than half of the population of the region live in or near Olot. Olot offers the largest number of services and is the best place in the region for shopping, markets, modern architecture, museums, and to get a sense of the lives of the local people. It also has the largest range of restaurant and lodging options, offering everything from budget eats and hostels to luxury hotels and Michelin-star dining. Olot has several museums worth visiting including ones dedicated to volcanoes, art, the making of saint icons, and a historical house museum. Other points of historical and architectural interest include the 18th century Sant Esteve church and the Renaissance Claustre del Carme (a former convent cloister, now houses the Olot School of Art). There are also a number of houses built in the Modernisme (Art Nouveau) style that you can admire in town. Olot has been an important market town for La Garrotxa since the 13th century. It is still the best place to see, taste, and buy the local products of the region. The Mercat d’Olot, which is an indoor market (open 6 days a week) sells all kinds of regional produce including meat, fish, vegetables, fruits, breads, spices, and prepared items. Olot also has weekly markets which include both food, craft, and clothing items, including the Monday market and the Rengle Market (every Friday). There are also annual arts and crafts markets held several times a year in the city that feature local products. The city is surrounded by volcanoes and four volcanoes are located within the city boundaries, with three having hiking paths that you can traverse. If you are interested in learning more about the local volcanoes, we also recommend heading to the green area of Parc Nou outside the city center to visit the Volcano Museum. A recommended hike from the city center is to follow the path up to the Montsacopa volcano. Here you’ll find the 19th century watchtower and Sant Francesc church, and you can even enjoy a drink or meal at the El Fortí del Volcà Montsacopa. The restaurant has seasonal hours so do check hours if you want to eat here. The hike here is relatively short (15 to 30 minutes depending on where you start) but steep so we appreciated a lunch break here. Olot is also the best spot to find fairs, festivals, and performance events in the area. I’d check this calendar for local events that may be happening during your visit or ask at the tourism information office when you arrive. There are a lot of surviving stone bridges dating back to the medieval period that were built over the rivers and streams in La Garrotxa and other areas of the Pyrenees. One of the most well-known is the medieval bridge in Besalú that extends over the Fluvià river. There are documents noting that a Romanesque bridge existed here since at least the 11th century, but the current bridge is much newer and has been restored over time. The picturesque bridge has a unique angular design with seven uneven arcs and two towers. 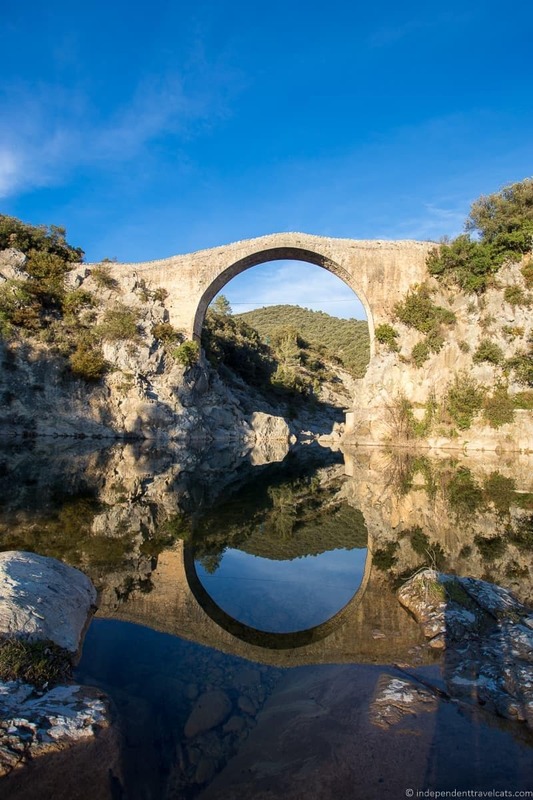 Another spectacular medieval bridge is the Pont de Llierca located between Montagut and Saderness over the Llierca river. This bridge is believed to date back to the 13th or 14th century. Others of interest include the Pont d’en Valentí near Saderness, the Roman Bridge (a.ka. Pont d’Oix) in Oix, and the medieval bridge in Sant Joan les Fonts. Most of the old stone bridges are no longer in use and some are hidden behind vegetation or are on old bridle paths. You are likely to come across some if you do some hiking in the region. 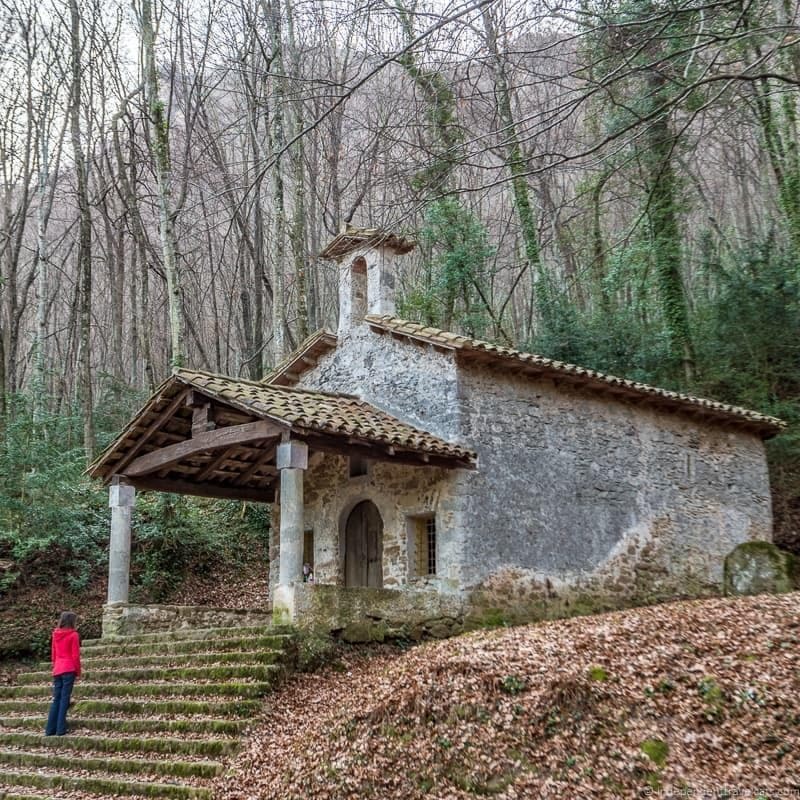 La Garrotxa is full of history and you only need to dig a little to uncover it. It just depends on your interests. Almost all the towns and villages have walking maps which is a good way to learn about the local history and historical attractions in each town. If you are interested in Roman history, you may want to consider a hike on the remains of the Capsacosta Roman Road. 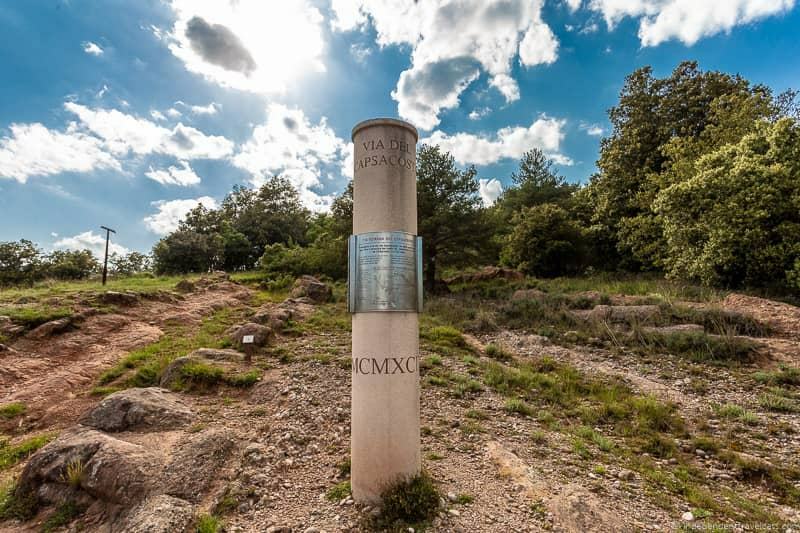 You’ll find sections of it in La Vall de Bianya, and it is now part of an 8 km hiking route with information panels. Also in this area is the Romanesque churches driving route which takes you to 15 different Romanesque churches in the area. In the 15th century, an uprising of peasants against the nobility took place in this region led by Francesc de Verntallat. Remença is the Catalan word for the existing serfdom of that time and the rebellion is often referred to now as the Revolt of the Remences. There are still a few remains from the Revolt of the Remences that exist in this region. A Remences trail has been set up that visits different villages and settings that were associated with the revolt, and can be done via hiking or driving. The museums of La Garrotxa are varied and are great places to learn about a particular subject whether it is volcanoes, art, local industries, or sausage. We’ll highlight the museums of this region in the next section. You’ll find the largest concentration of museums in Olot. Although museums are not the main reason most people come to La Garrotxa (since there are so many great ones in Barcelona and Girona! ), there are several museums that you may want to consider visiting. The majority of the museums in the region are located in Olot but you’ll also find a few in the smaller towns. Museu del Sants (Olot) – The Museum of Saints is a museum and active workshop (El Arte Cristiano) in Olot dedicated to the making of religious statues and iconography. This is a local industry that dates back to the 19th century. 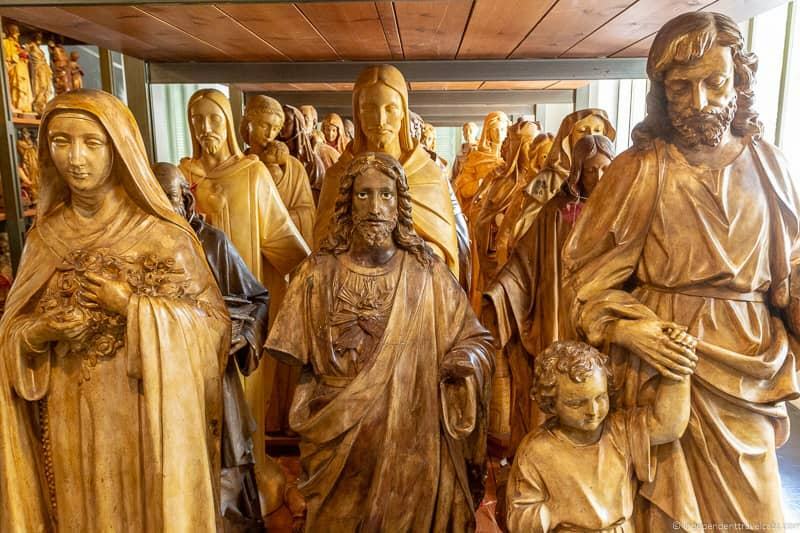 Visits are self-guided and include a video introduction, the museum, a room dedicated to sculptor Ramon Amadeu, and an exploration of the workshop where you get to see the manufacturing, decorating, and assembly process of the saint figures. There is also a gift shop and guided tours can be arranged in advance. 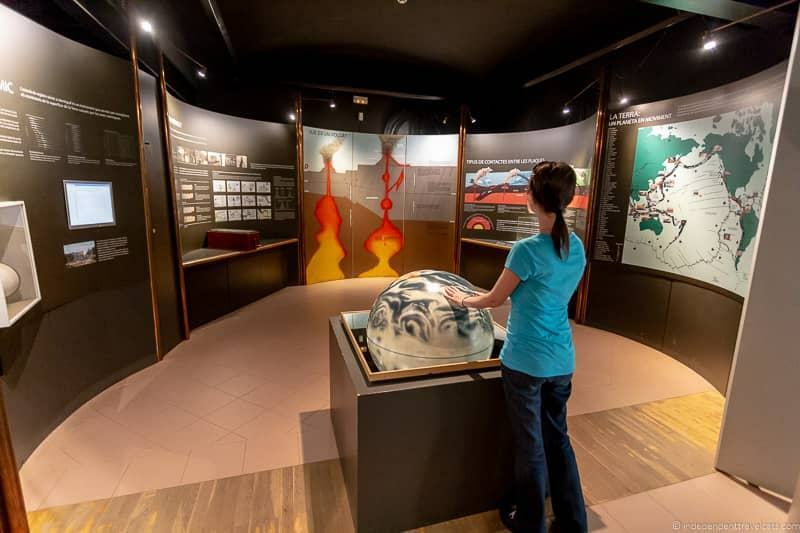 Museu dels Volcans (Olot) – The Volcano Museum is housed in a 19th century villa that focuses on the formation and activity of volcanoes around the world with a focus on the volcanoes around La Garrotxa. Visits begin with a video and then a self-guided visit of the museum. There is also a cafe located here and the museum is set within the Parc Nou gardens. Museu Garrotxa (Olot) – This Garrotxa Museum covers local history and art, with a focus on art and artists from the School of Olot. Some exhibitions are permanent and some are temporary. Casa Museu Can Trincheria (Olot) – A patrician home built in the 18th century and named for the wealthy Trincheria family. The house is richly decorated with period pieces and includes a nice collection of period art and furniture, including a nativity scene with figures by Ramon Amadeu. 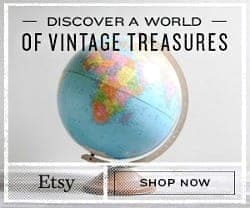 Museu de Miniatures i Microminiatures (Besalú) – Located in a former textile mill, this unusual museum is dedicated to miniatures, containing a large number of works from around the world. Most works are viewed via magnifying glasses to enjoy the intricate artworks that depict shops, landscapes, and events. If you enjoy things that are tiny, delicate, and intricate, this is the museum for you! Museo de Vietnam (Castellfollit de Roca) – A 6-room museum dedicated to the Vietnam War and special exhibits on Spain’s involvement in the war. One of few museums dedicated to the war outside of the United States and Vietnam. Also sells artifacts from the era. Museu de l’Embotit (Castellfollit de Roca) – A museum dedicated to the production of sausage in the area over the past 150 years. Local cured meats and sausages can be sampled and purchased here. If you only have time for one museum, our favorite museum in this area is the Museu del Sants which offers an interesting look into a unique local industry. But all are worth a stop depending on your interests! In La Garrotxa you’ll find all the Catalan favorites like pa amb tomàquet (bread and tomato with olive oil), Catalan sausages (butifarra), mar i muntanya (meat and seafood combo dishes), Crema catalana, and Catalan wines. But you’ll also find local specialities and local produce, and of course many products here are known for being grown in the volcanic soil. 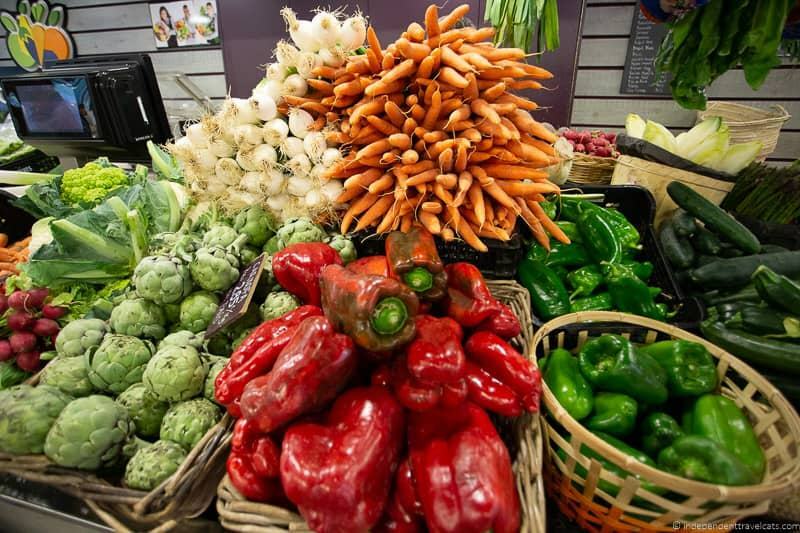 Local produce that is known from this region include buckwheat (fajol), onions, haricot beans, kidney beans, maize, yogurt, potatoes, chestnuts, pork, veal, wild mushrooms and truffles, and farro. 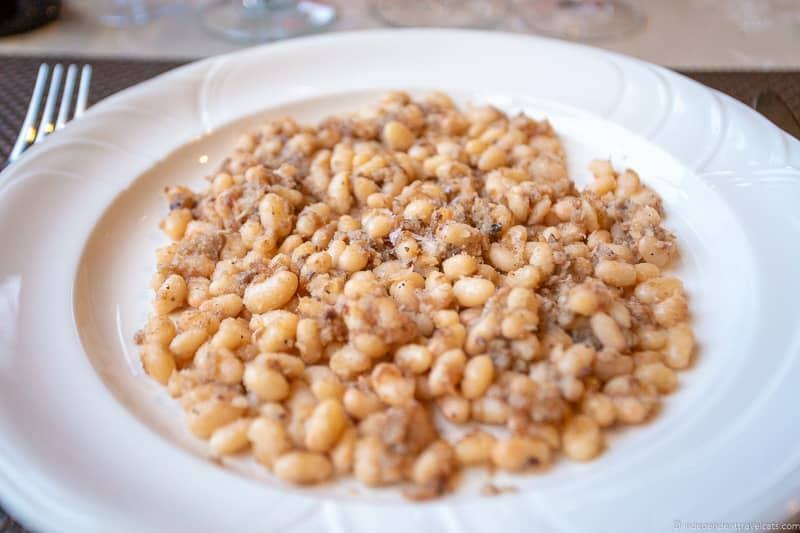 The white haricot beans (fesols) from Santa Pau and buckwheat are two of the better known foods from this region, and there are annual local festivals dedicated to both. A local goat’s cheese called Garrotxa is based on a traditional recipe that was revived in the 1980’s by local cheesemakers and the cheese is now popular in the region and is also exported elsewhere. Typical dishes include patates d’Olot (deep-fried potatoes stuffed with meat), amanida de peuada (pig’s trotter salad), farinetes (fried buckwheat porridge, sometimes flavored with ratafia), coca de llardons (sweet bread-cake with pork scratchings), and the Santa Pau white beans with sausage. Pork sausage is a common product and typical kinds include botfarra, piumoc, llonganissa, and fuet. Common alcoholic drinks are vermouth and ratafia (an herbal liqueur), as well as Catalan and Spanish wines. You may be able to even find some of the local buckwheat beer. A great way to try the dishes is to eat in the local restaurants and you will find everything from humble rural inns to the Michelin starred local restaurants of Les Cols (Olot) and Ca l’Enric (Vall de Bianya). You can try the Cuina Volcànica restaurants, which are a group of restaurants that use local produce. Many B&B’s and hotels also offer meals which is another way to enjoy the local cooking. One of our favorite recent meals was at Cal Sastre in Santa Pau. We had Santa Pau white beans with sausage, mushroom filled cannelloni w/ truffle sauce, beef cheek with potatoes and apple, and local Fageda yogurt with cactus. Paired with some Empordà wines, it was a lovely dinner! If you are staying in accommodation with a kitchen, you can also shop at farmer’s markets or local supermarkets and make your own dishes. The indoor market in Olot (Mercat d’Olot) is a great place to buy local produce and products, as well as the weekly markets. If you enjoy sausage and want to learn more about it, you might consider a visit to Mas Corominas. This is a local family pig farm located within the Volcanic Park, and here you can learn about the Duroc pig breed and the process for making sausage. They do tours with breakfast or an evening meal with a special tasting menu. They also sell their pork products at the Mercat d’Olot. Other farms that allow pre-arranged public visits include La Fageda (a dairy farm and cooperative) and La Xiquella (a traditional cheese dairy). 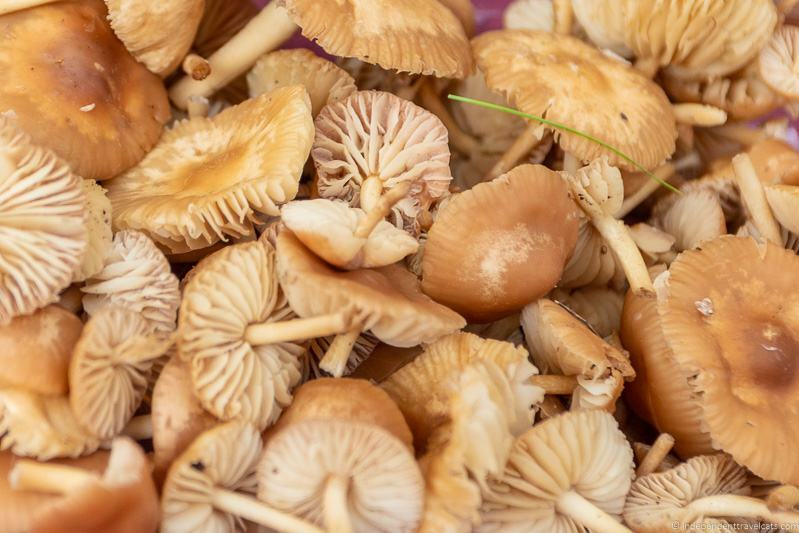 The Pyrenees region is known for its wild mushrooms (in fact so is much of Spain and France), and there are hundreds of different species of mushrooms in La Garrotxa. A study of mushrooms within just the La Garrotxa Volcanic Zone Natural Park from 2000 to 2002 recorded 487 different species of fungi! There are mushrooms growing in the area year round, but it depends on the type of mushroom you are hunting. Autumn is the most popular season for mushroom hunting. Mushroom hunting is popular in the area and the forested areas are often filled with mushrooms following a good rain. Many of the local boletaires (Catalan for mushroom hunters) have their favorite secret local spots they go to collect mushrooms. Certain types of mushrooms and truffles can bring good money at the market. Now, if you want to go mushroom hunting, it is not that difficult to find a mushroom. But it is a difficult task to correctly identify them. There are hundreds of species but many are inedible and poisonous. Unless you are familiar with the local mushrooms, we recommend that you don’t pick them or you go with a local guide who knows about mushrooms. There is unfortunately no safe way to distinguish poisonous mushrooms from edible outside of correctly identifying the species as many look very similar. Some locals, such as the folks at Mas Ombravella do run mushroom hunting activities in the area. They can take you out and teach you to find mushrooms, let you pick mushrooms, and teach you how to cook them. There are several waterfalls hidden in this region. 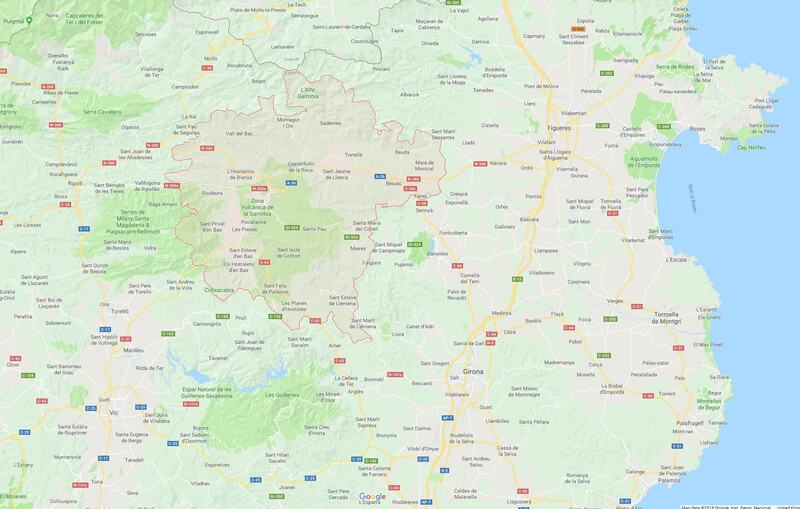 The primary area is in the southern part of the Garrotxa region around Les Planes d’Hostoles although there are also some pretty ones near Sant Joan les Fonts and in Alta Garrotxa. Around the town of Les Planes d’Hostoles lies a series of streams, rivers, and waterfalls! These make for great relatively short scenic hikes. 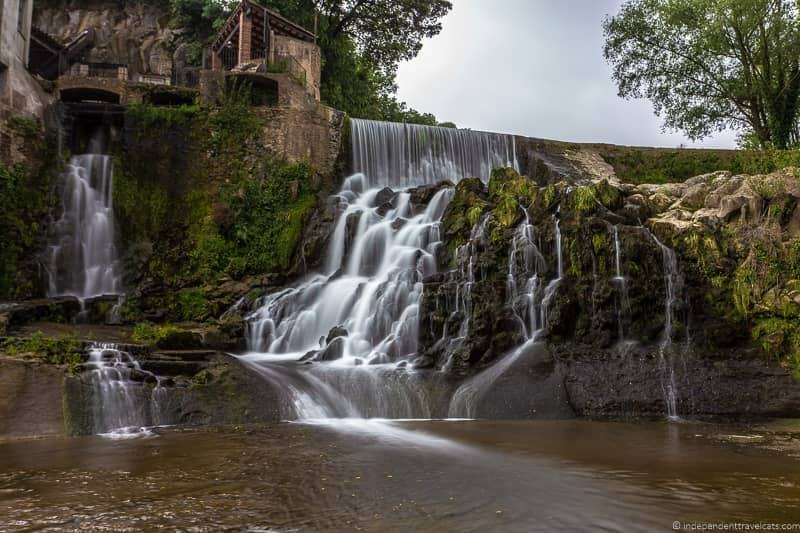 There are four main waterfalls in the area, these are: Gorg de la Plana, Gorg del Molí dels Murris, Gorg de Can Poetí, Gorga de Santa Margarida. The waterfalls range from short falls to longer falls, but all are scenic. The most popular is probably Gorg del Molí dels Murris. If you are limited on time, I’d just pick one or two to visit. All require some walking or hiking to reach and although all paths are considered easy, the paths are uneven and can be muddy/slippery. There is limited parking and during the day there is a parking area (small parking fee) where you can park and a staff member will give you a map to the different waterfalls. If you don’t have a hiking map, I’d get directions from either the tourism office or the parking staff before setting out as some sections of the trails are not well marked. Note that camping, fishing, BBQs, and campfires are prohibited in this natural area. The city council also advises against bathing or swimming here for safety reasons, but many locals do swim here in the summer months. There are no tourist facilities along the trails (e.g., toilets, trash cans, potable water) so come prepared with water and pack out any waste or garbage. La Garrotxa is a great area to drive around as the landscape is dotted with Romanesque churches, rural farmland, and medieval villages. There are volcanic landscapes and views of the Pyrenees to the north. Lots of great places for a scenic drive accompanied perhaps by some hiking or a relaxing picnic. One of our favorite drives in La Garrotxa is from Castellfollit de la Roca to Beget via Oix along the GIV 5221. It’s a beautiful windy mountain road that goes through rural landscapes and past medieval bridges and small villages until reaching Beget. Beget (part of the El Ripollès region) is a medieval town with a beautiful 12th century Romanesque church (Sant Cristòfol), old bridge, and wonderful old cobbled streets. If you are driving in winter, just be careful, especially on secondary and mountain roads within the Alta Garrotxa area such as the GIV 5521. The roads can become snow-covered and icy and it is a good idea to have winter tires or snow chains with you in case of a snowstorm (this happened to us actually) if you are planning to drive these roads. Attending a local festival or event is always a great way to learn more about the local culture. There are loads of saints’ days, festivals, fairs, and other events in La Garrotxa throughout the year. Festivals in the area celebrate local foods and products, saints and holidays, traditional occupations, and even magic and witchcraft! Some interesting and unique things you are likely to see at Catalan festivals are castelleres (human towers), correfoc (group of people running or dancing with fireworks), gegants or giants (people walking underneath giant papier-mâché figures), capgrossoss (people wearing massive papier-mâché heads and costumes), and sardanes (traditional circle group dance). One of the largest festivals in the area is the Festes de Tura in Olot, which is a 5-day celebration in September that takes place in Olot with concerts, a parade of giants, correfoc, dancing, fireworks, and displays of local products. If you want to see just about every aspect of a typical Catalan festival, this is a good one to attend. Another popular festival for visitors is the Medieval Festival in Besalú which also takes place in September. To find out more, you can check out this events calendar for events in Garrotxa, and this events calendar for events throughout the larger province of Girona. So there you have it, our guide to the La Garrotxa region! If you are looking for more information about this area, check out our Spanish Pyrenees travel guide, our Girona Pyrenees skiing guide, and our guides to the other Girona Pyrenees regions of El Ripollès and Baixa Cerdanya. Which of these activities would you enjoy doing in La Garrotxa? Have you visited this region before? If so, we’d love to hear about any experiences or tips you may have! Have a questions about visiting the Catalan Pyrenees or Costa Brava? As always, we welcome your questions and comments. Just leave it in the comments section below, and we’ll be sure to answer it as best as we can! Disclosure: The majority of our lodging, attraction entrances, and transportation in La Garrotxa was provided by the Patronat de Turisme Costa Brava Girona in order to experience and write about this region. However, we specifically chose most of the places we visited during our multiple visits to this region. As always, this article contains only our own honest thoughts and opinions. You can read more in our Ethics Code about how we accept work. I’ve been wanting to visit La Garrotxa for a few months now. I live in Barcelona and we were considering going in August just to avoid the beaches…but I realized it would be HOTTER in this region. 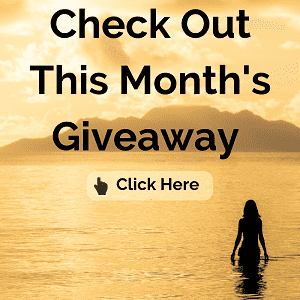 So hopefully go this month – thanks for the info! Hi Justine, It can be hot in the region in August; however, it is not normally as hot in La Garrotxa as it will be along the coast and beaches, The higher altitudes and hills and mountains of the Pyrenees help keep it cooler than at the beaches. There are also more trees and wooded areas. Good to see a La Garrotxa travel guide and more about the volcanic Catalonia Spain area. 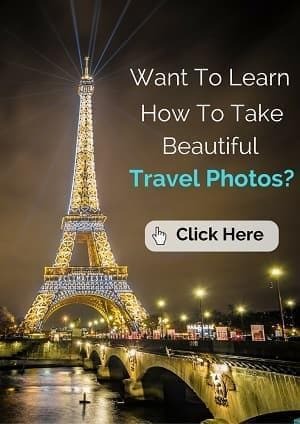 Not much out there and this is super helpful as we plan a trip throughout Spain and Andorra and want to spend time in Spanish Pyrenees. Thank you for sharing with us. Quick question, we have limited time but one of the places we really want to visit is Girona. Have you been and if can we see it easily in one day or would you recommend 2? This is one of the most detailed guides for Catalonia have ever read. This area is packed with history and magnificent sights. It’s slowly dawning on me just how much there is to see in Catalonia. Girona was already on my list but La Garrotxa looks awesome as well. Castellfolit de Roca in particular seems like the perfect place for me. Thanks for sharing. 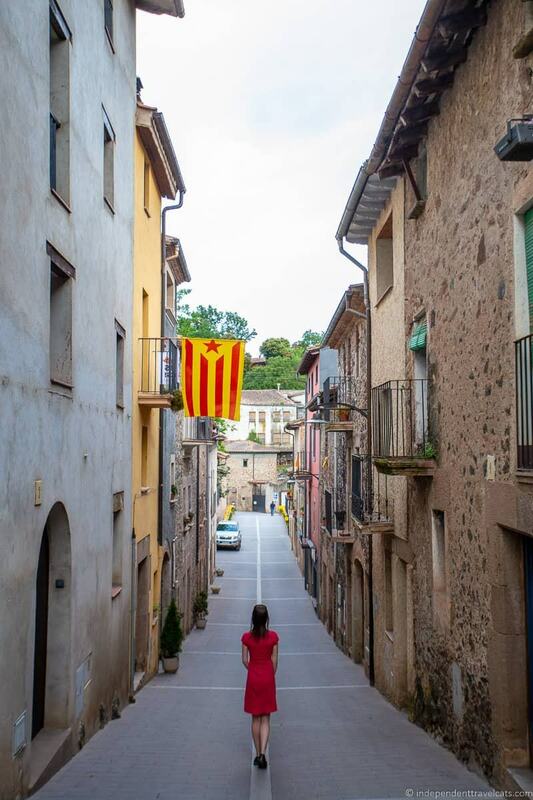 La Garrotxa is a great place to get away and many places where you daughter can explore medieval streets and your husband can get his daily dose of history! In March, yes, there is a chance of ice and/or snow on the roads/streets so you will want to keep that in mind and dress warm with good shoes. I’d also note that in some places, the smaller villages, there are not so many sidewalks. So do expect to have to walk on uneven surfaces and there are some steeper streets. If your husband is in a wheelchair or has difficulty getting around, I don’t think you’ll have too much of an issue, but you may need to take it slow. I’d also note that not all places are accessible for wheelchair users/those with reduced physical mobility, so if that is a concern I’d check ahead in terms of museums and/or accommodation. I think in terms of medieval villages you can wander around within walking distance, I’d probably choose your base in Santa Pau or Besalu, as these are the two most stunning and well-preserved of the villages that have that medieval feel. Your daughters could then wander around as much as they wish. Castellfollit de Roca may also be a good option, its smaller but definitely has lots of medieval charm. Olot is a good base as well but is more modern and larger, so a good place to base if you’d rather have more services (e.g., markets, banks, restaurants). But almost everything is within a short driving distance of medieval villages and you are more likely to find B&B’s and guesthouses outside the more popular towns. -In Santa Pau there is this B&B (just not sure how much English the hosts speak). Although not a B&B, Cal Sastre is a boutique hotel that is very appealing and has great reviews from families. -This guesthouse is in Castellfollit de Roca. –Hostal Mont-Rock – This guesthouse is located about a 5 minute walk from the medieval perched village of Castellfollit de Roca. Has good reviews and sounds like a good simple, family-friendly option. -There is also this family-run pension in Sant Joan les Fonts. If you are exploring outside La Garrotxa as well, I’d recommend Ripoll (history) for the monastery and Ethnographic Museum, Vic (medieval village), and Girona (medieval center and walls, history, museums). All are also possible as day trips from La Garrotxa. What a beautiful region you often find yourself in! Those clifftop villages are stunning! For not knowing of any travel guides for this region, this is likely as good as it’s gonna get! This guide is thoroughly detailed! Pinned for later! Besalu has been on my Spanish travel bucket list for a while – but I had no idea there were so many cool places in the area to visit. For instance, I’ve never even heard of La Garrotxa Volcanic Zone Natural Park – and I live in Valencian Community which is quite close LOL Thanks for sharing all these ideas – saved for my future trips! 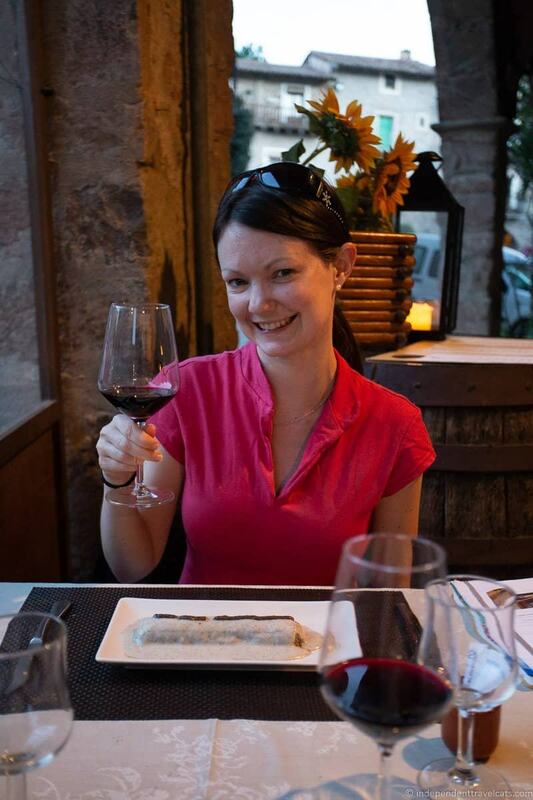 Hi Anna, Yes, out of the region, pretty Besalu get lots of visitors and is very well promoted. Its a really well-preserved town with lots of history, but there are loads of other places to visit in La Garrotxa as well. 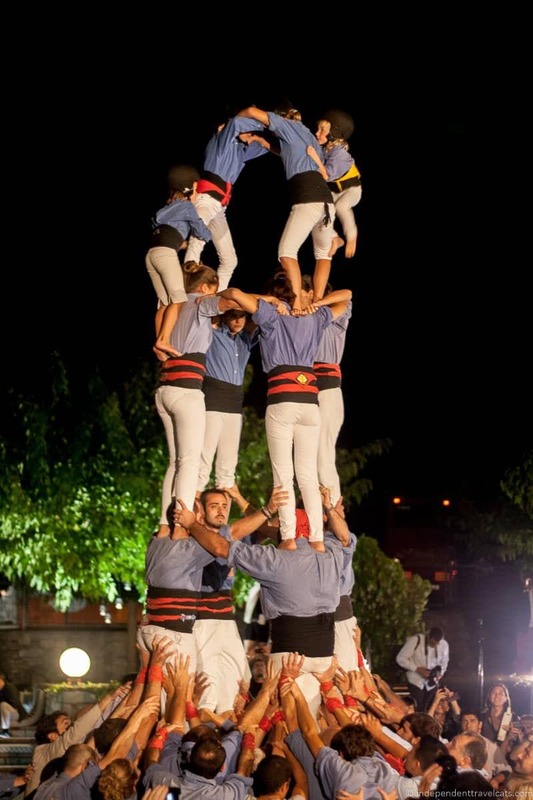 Living in Valencia, you probably know that it is an area of Spain that does share a lot of things in common with Catalonia as some of the traditions and foods are very similar (for example I think the human towers originated in Valencia as part of religious ceremonies). We’ve been to Costa Brava a few years ago for one of the TBEX meetings. We didn’t schedule too much time there, as we didn’t know what to expect. Unfortunately it was too late to change our schedule after we discovered how beautiful this area was, but we promised ourselves to return someday. I’m glad you gave me some ideas about other things to do while visiting Catalonia. We love mushroom hunting and used to do it all the time when we lived in Europe. It looks like a lovely area. I have been longing to do a hot air balloon ride so that would be on top of my list. Then I would also like to have some time for hiking. Whenever I read your posts I am more and more convinced that there is just more to see than there is time/money to see it! I didn’t get to Catalonia when we were in Spain, but I’m sure we will go back. Since I don’t feel very confident driving in Europe, I think I would probably vote for the guided tour option. There is something very appealing about having someone else take all the responsibility:) I love that bridge, and that the hot air balloons. I’d also be up the shorter hike to the extinct volcano… extinct being the key word! Hi Seana, Yes, I think that is definitely true! The more we travel, the more we know there are so many places we will never have the time to see. There are a number of guided day tours from both Barcelona and Girona to Garrotxa, making it easy to see some of the highlights and even go hiking/ballooning without needing a car or having to use public transport.